VISIONS OF THE NORTH: The Faces of Franklin's Men? The Faces of Franklin's Men? Of all the many different kinds of forensic studies that have been done of the remains of Franklin's men, the one that had not been tried, until now, was facial reconstruction. With the recent excavation of the remains reburied by Schwatka at the site later tagged as NgLj-3, the opportunity to do so arose in two relatively well-preserved human crania. Now, with the assistance of forensic artist Diana Trepkov, the team of Anne Keenleyside, Doug Stenton, and Robert Park have tried this technique, in the hopes that the resulting models might match with known photographs, or (at least) give us a more vivid sense of the identities of these otherwise nameless men. Their study has just appeared in the latest issue of The Polar Record, under the prosaic title of "Craniofacial Reconstructions of Two Members of Franklin's 1845 Expedition." Facial reconstruction is part science, part art. The science part starts with the skull or a cast of the skull, which is then dotted with small markers which indicate the average depth of muscles and flesh at each point. From there, the reconstructor builds up "tissue" using modeling clay, then adds features -- glass eyes, sculpted hair, and (in this case) a shirt collar to give the face a life-like appearance. Of course the hairline is an educated guess, as is the hair color -- unless, as was the case with Richard III, DNA evidence lends a clue, which in his case led the reconstructor to replace a brown wig with a blond one, The nose is also partly conjectural, depending on the state of the fragile bone and cartilaginous material in this part of the skull. That there is some element of interpretation is undeniable, but certainly the technique is worth trying. I've chosen just one of the reconstructions here -- it's certainly the more dramatic of the two. The model is based on "cranium #35," which is the better-preserved of the two. 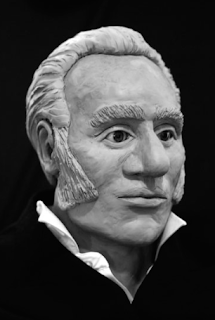 The most notable feature of this reconstruction is the enormous, bulbous nose of almost comical proportions. This is said to be based on "projecting nasal bones," although the preparatory sketch shows a more modest snout. The high cheekbones, heavy-set jaw, and slight underbite seem more realistically rendered. On the chance this this body, which may have been one of those in a boat abandoned near the site, was that of an officer, the authors compared this and the other face to the existing Daguerreotypes. They thought that it most resembled Graham Gore, while acknowledging that since Gore died prior to the 1848 abandonment, the skull can't be his. But I think the authors missed another possibility. The recently-identified Talbotype of Lieutenant John Irving (which I've blogged about earlier) shows several points of resemblance -- the large prognathous jaw, high cheekbones, and clifflike brow (the model's eyebrows obscure this feature, but it's quite evident in the Irving photo). Of course, Irving's grave was supposedly found by Schwatka, and those bones rest in peace in Edinburgh's Dean Cemetery -- or do they? The next step, as the authors acknowledge, is to try DNA testing; since there are Irving descendants available, if any DNA can be recovered from cranium #35, we are likely to have a much more definitive answer. Yes, indeed Marilyn. The third part of this trifecta of Franklin finds will doubtless be a paper using the DNA. Another interesting development. Here's hoping the discovery of the Erebus brings about the momentum needed to tie up a few other loose ends from the Todd Islets to the 'Irving' bones. Would be curious to hear your thoughts Russell on why it's thought one of these two skulls could belong to an officer. Is it simply because there are images of many of the officers or does it have something to do with the original Boat Place? If memory serves me correctly, I believe Hobson noted that one of the skeletons he found at his Boat Place could have been that of an officer. Is Schwatka's NgLj-3 believed to be the same Boat Place? If so, I'd say there's a greater chance one of these two individuals could have been an officer. I do agree there are some similarities between the reconstruction and the Irving Talbotype. 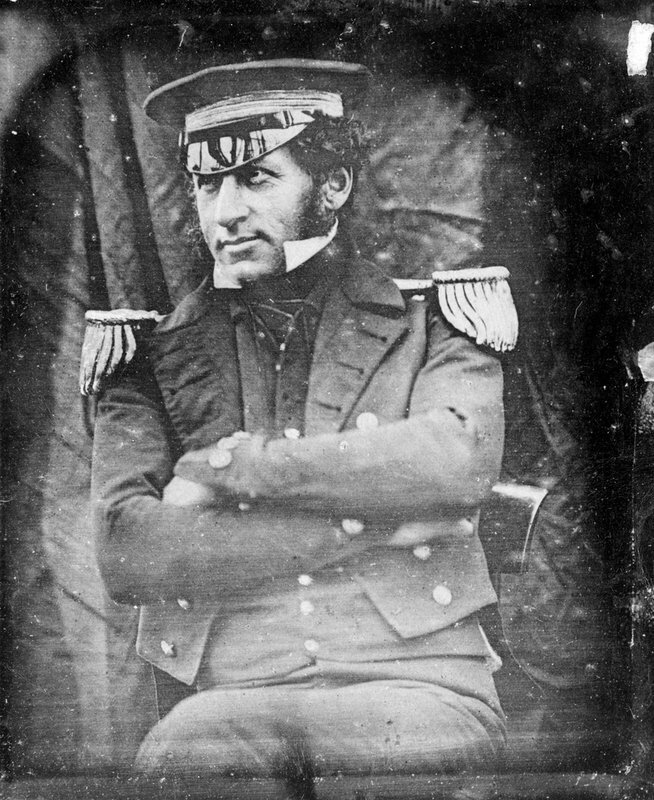 I thought the reconstruction looked like a picture of Lt. Fairholme. All speculation on my part though. The subject did bring to mind the reconstruction done about 5 yrs ago (? ), with the skull of what was presumed to be Lt. Vesconte and the reconstructed face came out looking like Henry Goodsir. The chemical analysis of the teeth also showed chemical signatures from someone from Goodsir's area of England, not LeVesconte. Not conclusive, but certainly suggestive it may well have been Goodsir. If nothing else, the reconstructions show a human face to all the names from this expedition. It keeps reminding me of the human tragedy of it, and how much they must have suffered. Don, thanks for your comment. There is a certain resemblance to Fairholme, though his nose does not quite approach this one in size and scope! And yes, it brings back some of the same questions that the case of the presumed skeleton of Le Vescone (see my earlier post on that reconstruction). I don't know if the teeth of these new crania are being looked at, but the same analysis could potentially be done on them; the interior of the tooth is also a good place to find some intact DNA. I have a feeling the next set of studies may prove more definitive!